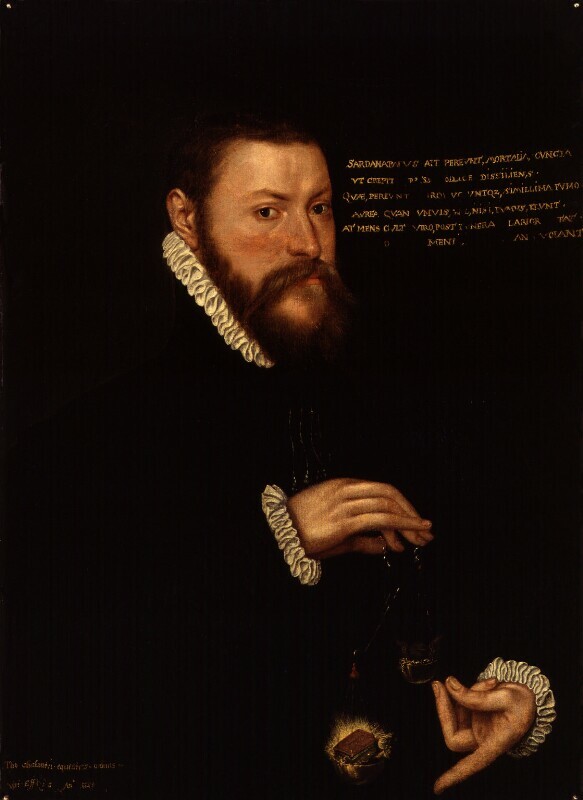 Sir Thomas Chaloner (1521-1565), Diplomat. Sitter associated with 4 portraits. Chaloner, the son of a London mercer and a diplomat, lived during the reigns of Henry VIII, Edward VI, Mary I and Elizabeth I. This striking portrait, the original of which is thought to have been painted in the Low Countries, is distinctly emblematic. The Latin verses would appear to be Chaloner's own and describe the realisation by the Assyrian king Sardanapulus of the transitory nature of earthly treasures: 'they fade black and begrimed with soot as though gold were nothing else but smoke...'. The emblem of the book outweighing the world and its riches is complimentary; Chaloner, the portrait tells us, values the spiritual and the intellectual rather than the worldly. Queen Elizabeth I rejects a marriage proposal from Philip II of Spain; a proposal from Charles Archduke of Austria is also declined. Elizabeth I is crowned at Westminster Abbey. Acts of Supremacy and Uniformity approve a new religious settlement reinstating the Protestant faith and introducing the Elizabethan Prayer Book. The Italian anatomist Matteo Realdo Colombo publishes De re anatomica (On Things Anatomical), in which he describes the pulmonary circulation of blood. Mary Queen of Scots becomes Queen of France when her husband Francis II succeeds to the French throne. Scottish Protestants under John Knox rebel against Queen Mary. Monasteries are sacked and royal tombs desecrated. The Treaty of Cateau-Cambrésis ends the war between France, Spain and England. Spain is confirmed as the dominant power in Italy.